Three of William's siblings -- Zachariah, John and Sarah were captured by Indians and taken to Canada. According to a variety of reasonably reliable sources, including Green, Sarah was ransomed to the French and became a nun, following the course of her better-known 1st cousin once removed -- Lydia Longley. Meanwhile, the two boys reportedly embraced the Mohawk culture and became chiefs. The Tarbell captives were 2nd cousins to my direct ancestry, and the Longley captives were 1st cousins. My 7th great grandfather. William's family was well known in his day. He was the second of ten children, and on the evening of 20 June 1707 three of his younger siblings, Sarah, John, and Zechariah, were kidnapped from behind their Groton farmhouse by a band of Mohawk raiders and taken to Canada. Sarah, about 14, was ransomed by French nuns and converted to Catholicism (surely a worse fate for her family than having been kidnapped), and she lived out her life in a convent on the St. Lawrence. The two boys, John and Zechariah, about 12 and 7, were adopted by the Mohawks and grew up to be prominent members of the Akwesasne community, marrying into the tribe and raising large families. Three hundred years later, Tarbell remains a common Mohawk surname along the St. Lawrence, all of them cousins of this William. Ah, Peter got to the story before I did. In 2007 I wrote a tiny essay for the 300th anniversary of the Tarbell capture and tried to send it to one of the Mohawk newspapers, but didn't get an answer. Sidebar: William's great-uncle John Tarbell was Rebecca Nurse's son-in-law, having married her daughter Mary, and he was something of a hero in the witch hysteria, consistently opposing Parris and challenging the Putnams' allegations. 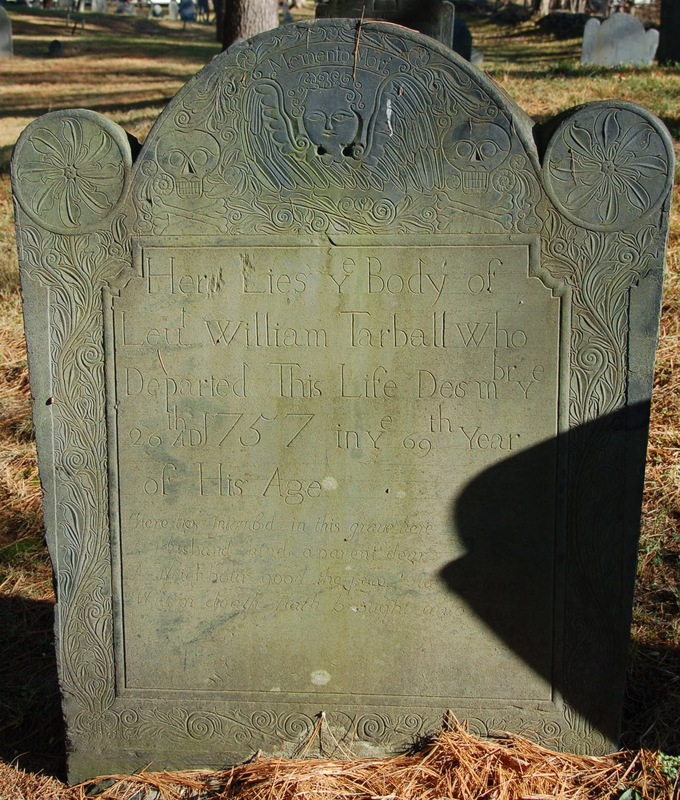 Also, John's sister Sarah (our William Tarbell's great-aunt) was Rebecca Nurse's daughter-in-law, having married Francis Nurse Jr.
John's gravestone -- or what's left of it -- is pictured at A Very Grave Matter. And to make a carver comment: I think this William Tarbell stone is an example of the very early work of William Park, but I would be glad to be corrected. Within a few years Park's style became rather standardized and quite different from this stone, but in his very early period his style was all over the place, and no two stones look quite alike. In particular, he clearly made an effort to become an expert letter-carver in the early 1760s. This stone, while clear and legible, doesn't display the orthographic mastery he later acquired. Incidentally, this William Tarbell is the direct ancestor of the famous American Impressionist artist, Edmund C. Tarbell (1862-1938), born in West Groton.